I’m a firm believer in the development of new and more powerful ways to visually communicate important messages non-verbally. As a wayfinding professional and symbol designer with a keen interest in all things non-verbal, I say “by all means, let’s move communicating the accessibility concept forward.” But caution is appropriate when attempting to replace a well-established and vitally important societal icon with something that has not been fully usability tested, approved by relevant public regulators, or that has survived the rigors of a comprehensive design process. A significant, but troubling attempt was made more than five years ago to replace the ISA (International Symbol of Access), and its selective implementation continues to roil the sign industry, wayfinding designers, and regulatory agencies. 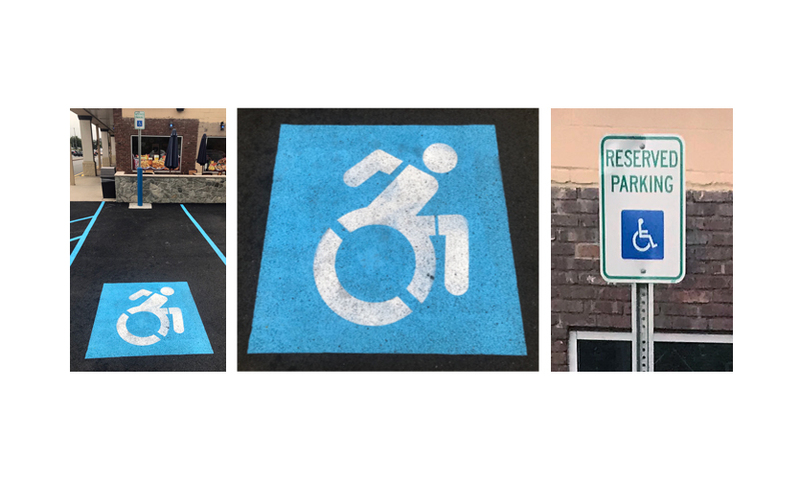 On July 25, 2014, New York Governor Andrew M. Cuomo signed legislation (A.8193/S.6846) that amended existing law to require the removal of the word “handicapped” from new or replaced state signage, as well as update and destigmatize the accessibility logo. 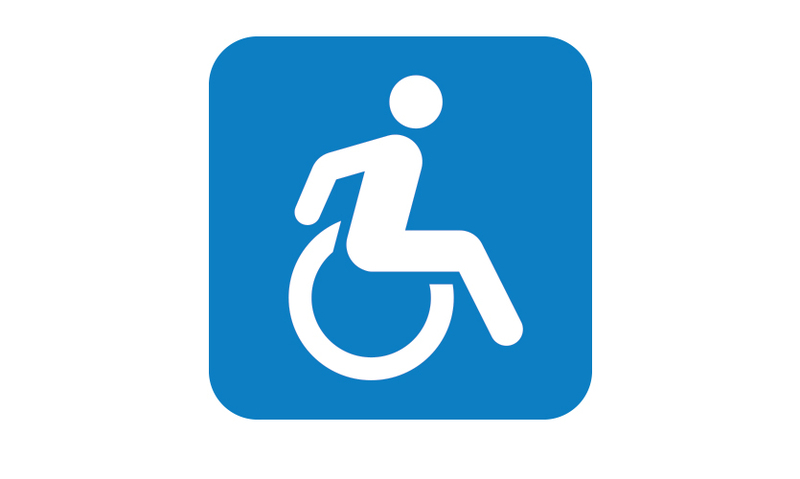 The state changed the terminology on such signs, employing the word “accessible” instead of “handicapped.” The newly revamped logo design (image 01, below), known as the “Accessible Icon,” depicts an ‘in-motion’ visual of a person using a wheelchair. To date it has been adopted by a number of organizations and municipalities in the U.S., including the NFL’s Jacksonville Jaguars, the city of Merriam, Kansas, and New York City, among other localities, businesses and schools. Abroad, disability organizations such as the Enabling Unit in India are promoting this version. Indeed, the AIP symbol has popped up on parking lots throughout New York State, usually stenciled onto the pavement. Federal Highway Department has chosen not to approve the symbol, thus above the pavement, one will often see the old, original ISA on a signpost, as it has appeared since 1968 (image 03). 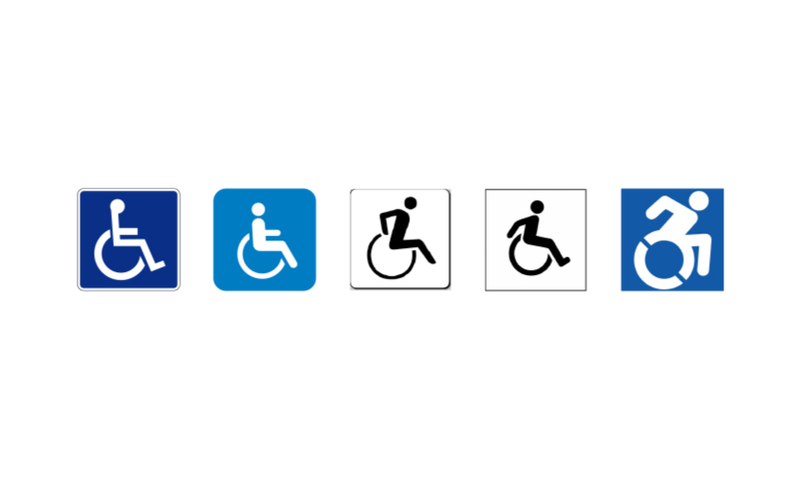 In late 2014, one of my transportation clients (the MTA) worriedly asked me to look into this new symbol further, because altering or changing a ubiquitous accessibility symbol sign in use is not an insignificant prospect for any large public institution. As part of a comprehensive assessment of the vast New York system, I had already recommended in 2009 that the MTA utilize the Whitehouse Meeker variant (image 02, second from left), which was accepted and has gradually been implemented. As part of the process of researching the new AIP accessibility symbol being mandated by Albany, I therefore set out to study it’s viability by looking at the response to it by wayfinding design and standards professionals, governmental agencies and ADA specialists, as well as the disability community itself. I was immediately struck by the realization that few, if any, comments were in evidence by any reputable or established wayfinding or symbol design specialists in favor of, or against the new design on all of the web sites, news articles, or announcements researched, including those of NY State. As a wayfinding professional, my initial impression of the newly proposed AIP symbol was at first incredulity, followed by unmitigated exasperation. While there is universal agreement among those in my field that there’s room for improvement in the original International Symbol of Access (ISA) symbol dating from 1968, there are also alternatives available and in use already. Upon further reflection, it appears that the extreme approach taken by the AIP has erred in a number of important respects (see my detailed brief). The most important aspect being that the idea conveyed by the AIP is all about speed and even racing. The subject is literally bursting out of its box, head over heels, arms and legs aflutter. As they say in the Boy Scouts, “Safety first!” What’s the hurry? – municipal traffic ‘calming’ is currently de rigeur. The AIP symbol might be a contender to represent a Paralympics wheelchair race event… but not for a crowded subway platform or elevator (not to mention that the 45-degree angle stencil line is reminiscent of the standard prohibition slash). Indeed, the American National Standards Institute (ANSI) A117 committee disapproved a proposal to use the new symbol in lieu of the ISA (International Symbol of Access, Figure 2) specified in the ADA Standards. The proposal was defeated because the committee was convinced that consistency among symbols is important, particularly for people with low vision or cognitive disabilities. And in May 2015, the Department of Transportation again declined to adopt the symbol, noting that it was not “unmistakably similar” to the original. Therein lies the rub. 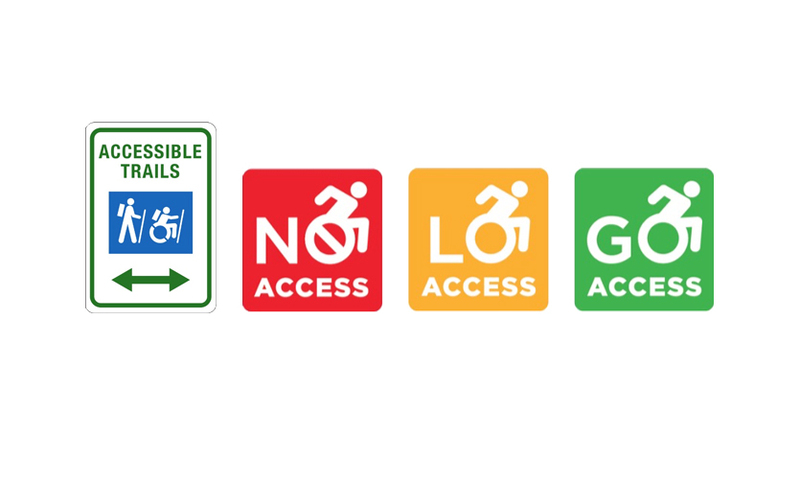 While the noble effort to modify the symbol for access to the new ‘in-motion symbol’ can be understood from the viewpoint of wanting to “de-stigmatize the access logo and to correct society’s understanding of accessibility”—as stated by Governor Cuomo—this particular path toward those goals has proven, in my considered opinion, to be a decisive stumble (image 03, below). The advocates of the new ‘Accessible Icon’ design have inadvertently chosen a visually flawed vehicle to make their point, and risk alienating and confusing the very audience whose lives it was ostensibly designed to enhance, not to mention the general public. So how did the AIP get this far? Why weren’t nationally recognized information design professionals consulted: venerable and well-established organizations such as the American Institute of Graphic Arts or Society for Experiential Graphic Design? It’s a loaded subject, but let’s just say that there are too few protocols or funds in place currently for the vetting or testing of critically important public information icons as needs arise and change, as is done rigorously in China.The network and conduits for oversight of such matters in the United States government have substantially atrophied, become vestigial, or slowed to a crawl, resulting in New York State’s fateful decision to throw caution to the wind and proceed with the AIP. Ultimate Symbol decided to join the conversation and develop a more viable solution. To summarize, the goal is the creation of a ‘proactive’ accessibility symbol that stays within essential and well-established legal guidelines for comprehension and efficacy, particularly within the transportation context. It is imperative that wayfinding designers fully acknowledge and understand the humane desire of the accessible community to be represented appropriately (not ‘lifeless,’ ‘helpless,’ and/or ‘inert’), entities like the great state of New York’s sincere political quest to honor their interests, and for regulatory agencies to meet current oversight requirements mandated by multiple committees and governmental bodies. Finding a visual ‘sweet spot’ that meets these varied criteria is certainly challenging. After carefully reviewing the legacy of attempts over the past five decades, my design team and I decided to look for ‘common ground,’ and to propose a solution founded in established official practice, yet sensitive to how today’s culture informs. Starting with the generally accepted and ADA-compliant Whitehouse/Meeker variant, designed for the Army Corps of Engineers in the early 80’s (image 05, left), we looked at the mechanics of wheelchair use (image 05, middle) to see if that might influence the design, rather than staying completely conceptual in approach. The result (image 06, center), fulfills many criteria and may be able to meet ADA requirements including being “unmistakably similar” to the original ISA. The process now proceeds to gathering input from the design community at large, before presenting it elsewhere and to the buzzsaw of public opinion. The time has come to move beyond the discord, confusion, and inconsistency thrust upon us by the incompletely conceived AIP symbol (image 06, right, in a positive contrast symbol comparison). While perhaps not perfection, the update to the International Symbol of Access proposed by Ultimate Symbol (image 07) is a reasonable, balanced solution, that meets international design standards, and just may move the subject forward in a constructive manner while meeting the demands of the accessibility community. 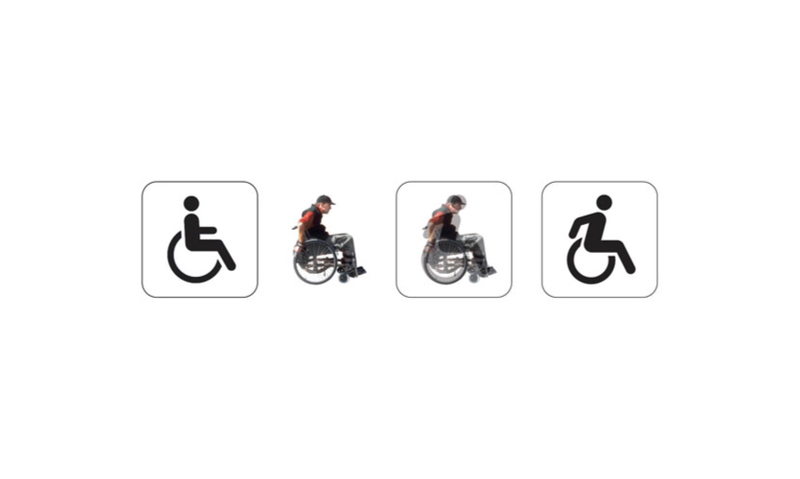 The wheelchair user is lively and in motion… just not creating a commotion. Reactions so far are generally positive… what do you think? Login to post your comments and thoughts. 01: The newly revamped logo design, known as the “Accessible Icon,” depicts an ‘in-motion’ visual of a person using a wheelchair. 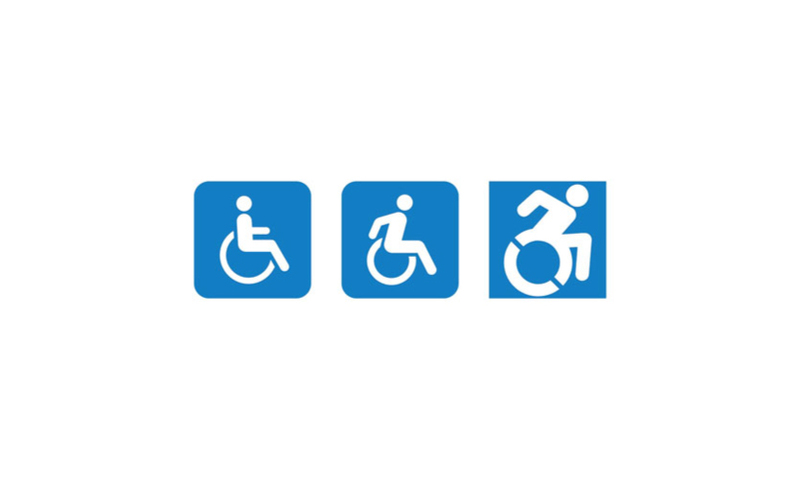 02: (left to right) Original ISA (International Symbol of Access (1968), ADA-compliant (Whitehouse/Meeker, early 80’s), tipsy ‘In-motion’ version (Brendan Murphy, 1986), ‘jumping over a barrel’ in-motion variant (with foot), AIP (2012). 03: Insult to injury – the AIP suffers further indignities by having it’s arm and leg separated with stencil cut lines (or is that an armband and shorts?). The U.S. Department of Transportation does not officially recognize or promote the AIP, thus inconsistency reigns throughout the Empire State. 04: Unofficial sign applications purportedly ‘enhancing’ the AIP. 05: Starting with the ADA-compliant Whitehouse/Meeker variant, they looked at the mechanics of wheelchair use to see if that might influence the design. 06: The result (center), fulfills many criteria and may be able to meet ADA requirements including being “unmistakably similar” to the original ISA.